Puck » I Gots Me a Patreon! I Gots Me a Patreon! So every other webcomic on the planet had signed up for Patreon, and this shoe had to drop eventually. Please know that this changes absolutely nothing about how the comic runs. It’s still free on this site, and bonus stuff is still going to pop up on TWC as voting incentives. All the extras from previous months and years, though, will only be accessible through Patreon now (and there’s a LOT of extras, given that I’ve been doing this for five years). Just one dollar a month gets you full access! It’ll take a while for me to post all the old stuff, as well as the new material as it comes out, but I have to say that for Puck fans who can spare a dollar, it might – MIGHT – be worth it. 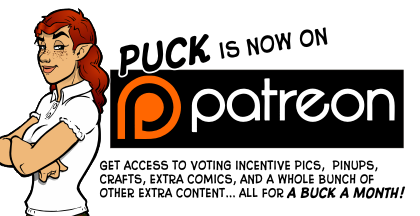 CLICK HERE TO BECOME A PATRON OF PUCK! A PUCKTRON? That sounds rad, like gestalt transformer or something! I guess this explains why I hadn’t been Patreoning you earlier. That’s no excuse. I was Patreon-ing Puck before there was a Patreon. If you wanted to do it badly enough, you’ll find a way. I’m not kidding either and El Gec will back me up on that. Hey, buying me cotton candy at the fall fair doesn’t count. Apart from Vimy Ridge, I’ve never even been to Canada! And you deserve praise for it. I heap praise upon you in big, piling heapfuls. Well, Pat, I almost did, so, so, so…. It was a real Tony Stark in the cave moment for me but when you really want to give your money desperately enough, you find a way. A vestigial Smackjeeves site, a nominal Project Wonderful setup and some duct tape later … Can you believe it’s been since early December and about 7 months now? No. I cannot believe it. That’s why when I come flying at you with my jerry-rigged Patreon made out of spare parts, I’m taking you down like Godzilla before you even knew what hit you. It does. And I thank you for inviting me into your select, exclusive list. Mine on the other hand … er … well … maybe the less said the better perhaps. As you’ve pointed out, it’s very exclusive; and I’ll tell you the same thing I told Adam. Wow, is that Phoebe RIDING ME ? Now don’t tell me that’s NOT A CAT ! That’s a mecha-tiger. Of the flame-breathing variety. Soooo … It’s a Cat after eating some good Thai ? so Mr. “I’ll never sell my soul to Patreon” has just become sould!!!!! Bout damn time!!!!! I’ve been wanting you to do this for a couple of years, dude! Well, I came to the realization that though I’m uncomfortable with Patreon and Kickstarter and the like, it’s mostly because I’m old. I like the idea of buying albums too, but that’s not going to change Spotify. So now I’m the tardiest to the partiest that you can possibly be with Patreon. But better late than never? Very true. lol. Another recommendation I would like to make that will make you cringe though…. Put the patreon link in one of the side bars as more or less a permanent fixture on the site, that way people won’t miss it. Now that you’ve joined, Patreon is going to be audited and shut down. That’s how it always seems to work for me; get in on a hot new stock and BAAM!! Nigerian Prince. Well, that’s the way life goes for me. I’m good at ruining a good thing. In the defence of old people, well I’m older than you and I’d been saying “Do it … go on, do it, you know you want to.” for some time now. Best of luck with your Patreon EG. I hope you make enough cash to help keep Puck fun to make. Well, I have no delusions about turning a huge profit. It’s more that added money frees up a bit more for advertising, which in turn allows the comic to grow. I wish some of the money was actually profit for me, but in reality pretty much all of my comic income goes right back into the comic, for hosting and ads and all that.